Walking on an alpine glacier is a once-in-a-lifetime adventure that many feel is unattainable, an experience reserved for the ultra-fit or wealthy. 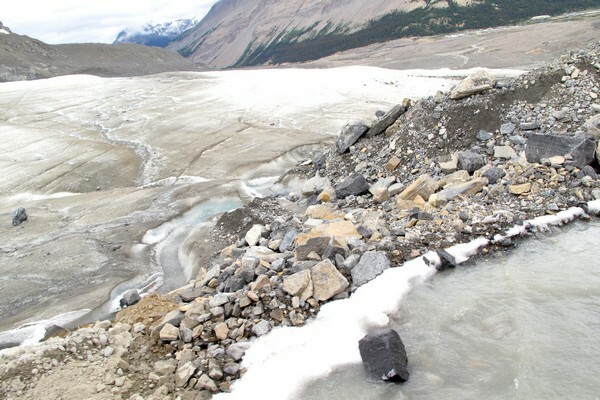 While that may be true for most glaciers in the Canadian Rockies, the good news is that the Columbia Icefield Glacier Adventure makes it possible for anyone to step on the crunchy surface of the Athabasca Glacier. The Athabasaca Glacier, one of eight glaciers fed by the massive Columbia Icefield, is the most visited glacier in North America. One of the reasons it receives so many visitors is because of its convenient location near the Icefields Parkway, between the towns of Banff and Jasper. 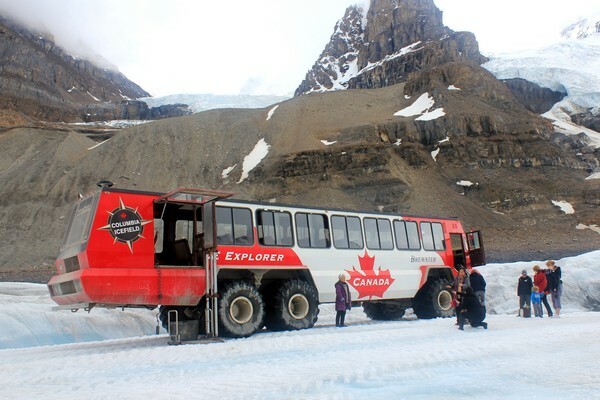 Another reason is because you can hop on a massive Ice Explorer that transports you directly to the center of the glacier, no crampons or helicopter landings required. Now, the mountaineer purist will argue that taking an Ice Explorer to the glacier is the lazy man’s way, an observation we will not argue, but we don’t have the time nor the desire to master the art of glacier trekking. We also had our infant and toddler with us, so hiking was not feasible this time. 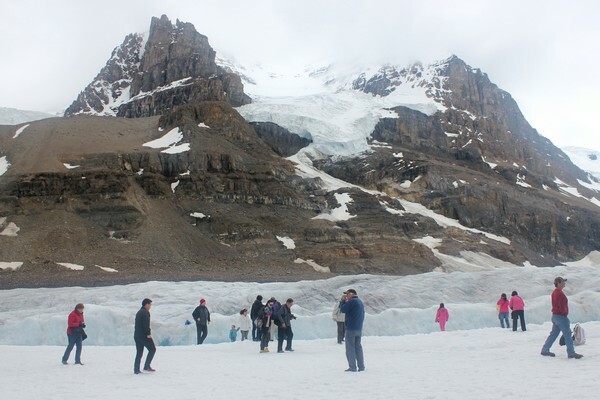 The 80 minute tour begins at the Columbia Icefield Glacier Discovery Centre, located on the opposite side of the Icefields Parkway in Jasper National Park. 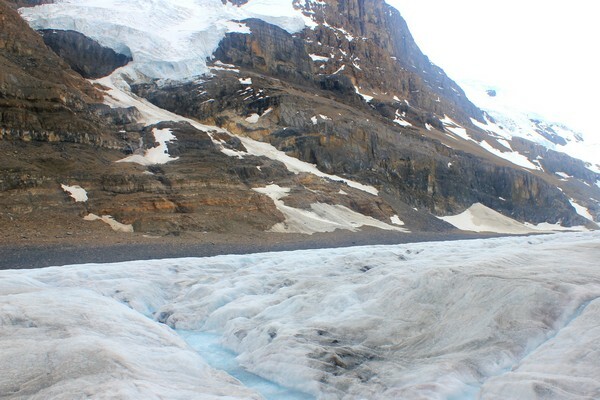 If you’re a fan of the Amazing Race Canada, you might recognize the Athabasca Glacier as the starting point of Season 2. You can read about it here. 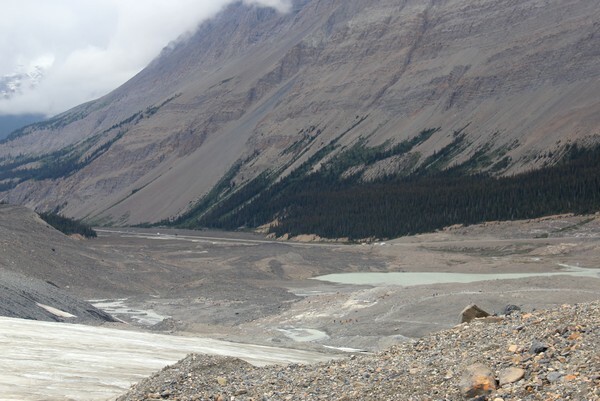 Visitors can also park at the base of the Athabasca Glacier and hike up the ice field instead of taking an Ice Explorer (look at the bottom right of the first photo to see the parking lot in relation to the glacier), but it’s not recommended without a guide and proper equipment. There have been reports of unprepared tourists falling down hidden crevasses, often to their death. Have you watched the movie Touching the Void? Enough said. After a short bus ride to a transfer station on the mountain, we climbed into the massive Ice Explorer and began our ascent up the glacier. 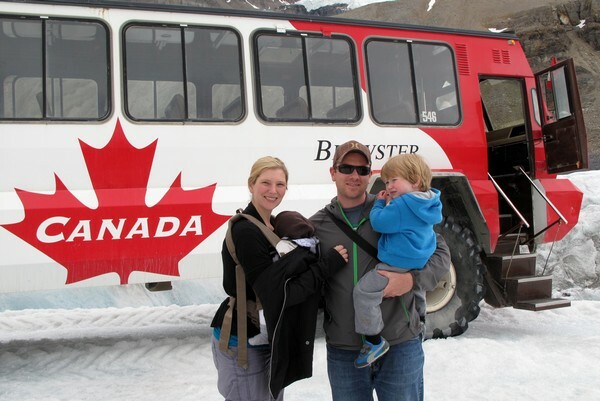 What makes this tour great is that anyone and everyone can experience the glacier, including toddlers and the elderly. Many of the Brewster’s Ice Explorer fleet have special wheelchair lifts that can comfortably carry up to 4 wheelchairs at a time, in addition to the regular 56 passenger seats. Prior to reaching the edge of the glacier, the Ice Explorer descends down a steep stone road that feels like a 45 degree angle. If you look at the above photo, you can see the steep drop approaching. That tiny looking vehicle in the distance is a full size snow plow, just to put scale into perspective. The Ice Explorers intentionally pass through a river before driving on the glacier, removing dust and dirt from the tires and wheel base. 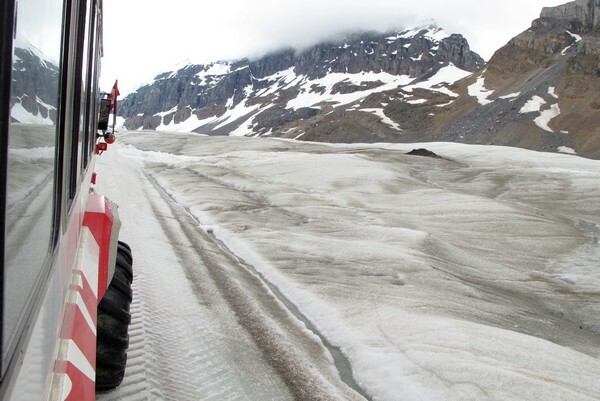 This prevents dirt from landing on the glacier, which can impact the speed of the glacial melt. 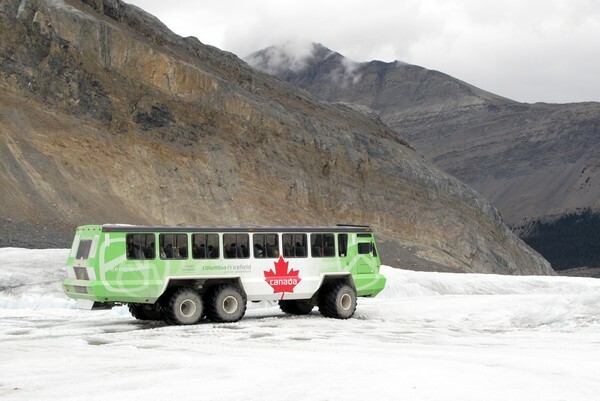 Once on the Athabasca Glacier, the Ice Explorer travels for another few minutes before it reaches its final destination – a carved out section of the glacier that is monitored and inspected daily to ensure it’s safe for visitors to walk on. 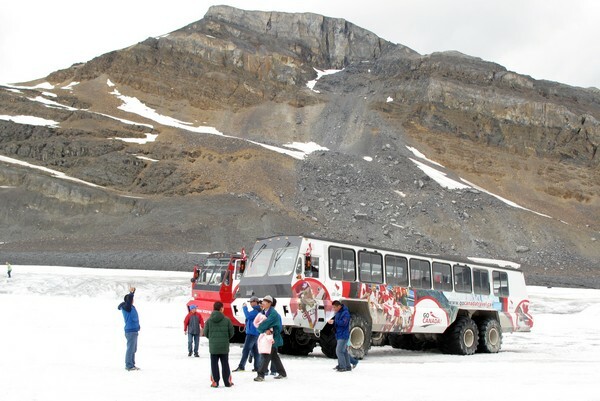 Now, if you’re expecting an intimate experience with the glacier you’ll be disappointed to learn that there will be many bus loads of tourists on the glacier with you. The glacier adventure is a hot ticket during the summer months, with a new Ice Explorer arriving and departing every few minutes. If you go into the tour with this knowledge, you’ll think nothing of it when you see waves of tourists coming and going. Regardless, once you step out onto the glacier you’ll be surrounded by gorgeous mountain peaks and glacial vistas. 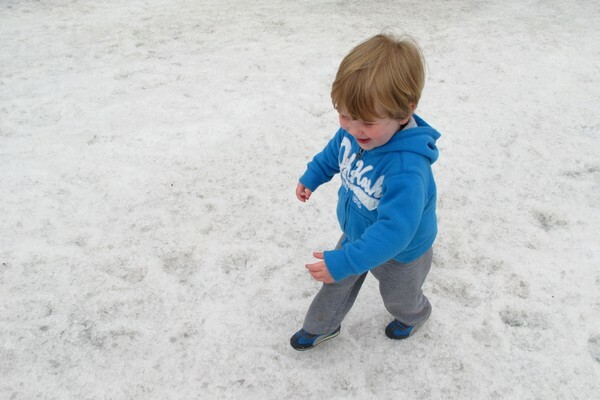 Braydon was pretty excited to run around on a glacier. 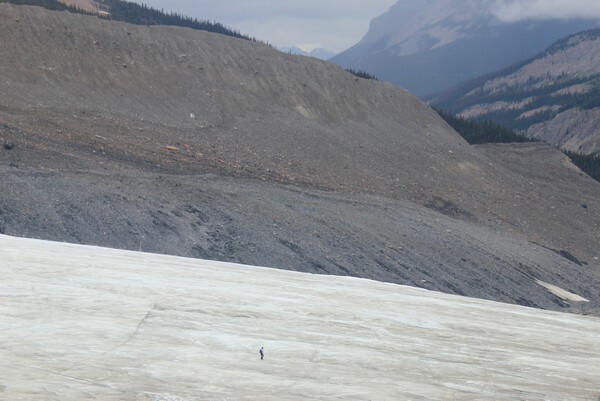 Interesting fact – The Columbia Icefield is the largest sub-polar body of ice in North America. It is one of the reasons why the United Nations declared Canada’s four Rocky Mountain Parks World Heritage Sites. The area designated specifically for tourists is marked with cones. You are not allowed to step outside of the designated area for safety reasons. 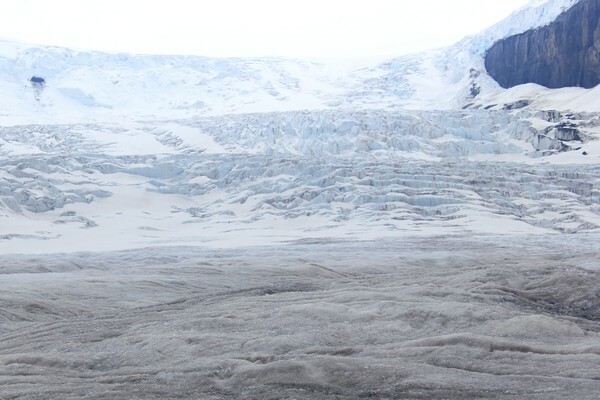 The glacier is constantly shifting and moving, which creates hidden crevasses that can swallow up tourists. It’s serious business, so don’t mess around. While walking around the safe zone, keep an eye out for water pockets. Most are marked, but if you’re not paying attention you might get an icy soaker. I watched a man step into one of these water pockets while trying to frame his family into a photo. He didn’t look too happy about it. You’ve been warned. Travel tip – bring a water bottle with you so that you can drink some cold, crisp glacier water. It’s the most refreshing and delicious water you will ever taste. There is flowing water at the edge of the safe zone, so it’s easy to fill up a water bottle or two. Interesting facts – Glacier ice is blue because the dense ice of the glacier absorbs every other color except blue – so it’s kind of like an optical illusion. 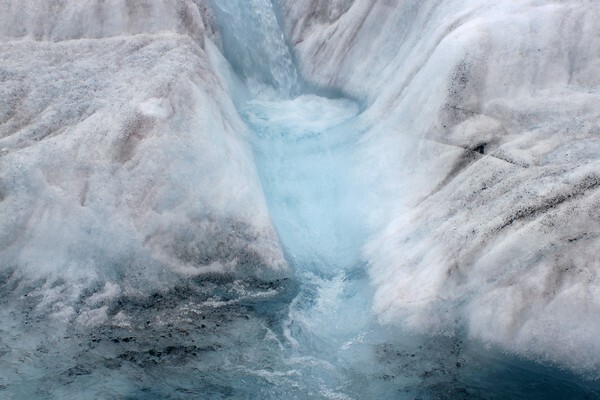 Glacial ice is very different from the frozen water we get from the freezer. It’s not just layers of frozen compacted snow, it often includes the rocks, dirt and organic material that it collects as it pushes its way down the mountain. We were told that if we put a piece of glacial ice in a normal sized glass of water, there’s a pretty good chance the glass will break because of all the pressurized air bubbles that are present in glacial ice. Who’s up for a science experiment? You only get 15 minutes to explore the glacier and snap your photos, so it can feel a bit rushed. It was cloudy and overcast during our visit, so we didn’t get the postcard photos we were hoping for, but we did manage to get a great family portrait, even though Baby Connor refused to look in the direction of the camera. Ice Explorers depart every 15 to 30 minutes – weather permitting. Reservations are not required. 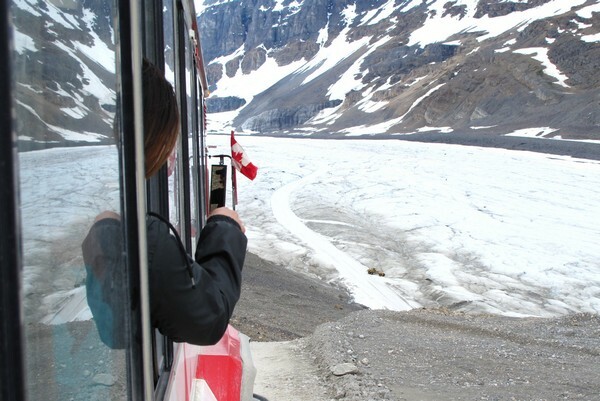 The price for the Glacier Adventure is $49.95 for adults and children aged 6-15 costs $24.95. Children under the age of 5 are free. You can watch a promotional video about the experience here. Dress in warm layers and make sure to wear closed-toe shoes with sturdy soles. Hiking boots or running shoes are best. 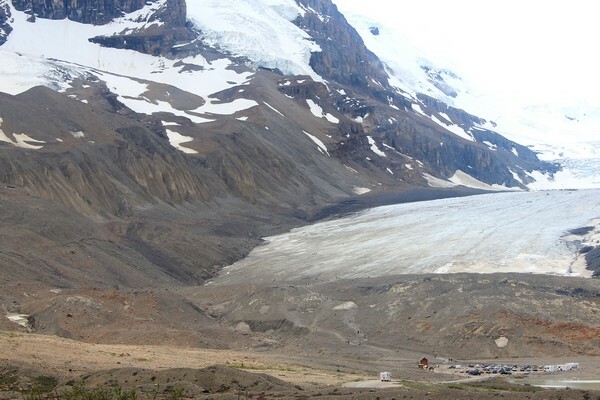 Expect the temperature to be about 15 degrees Celsius cooler on the ice than at the Columbia Icefield Glacier Discovery Centre. 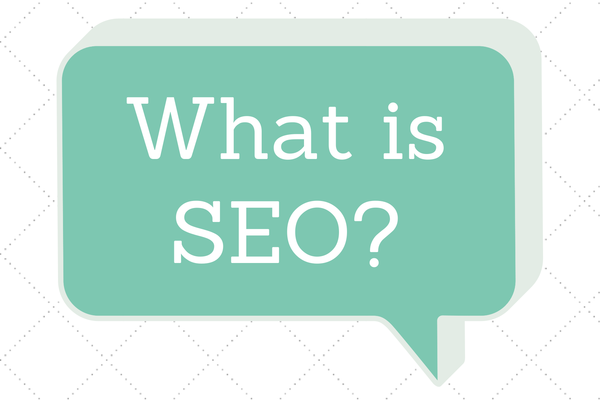 Visit this website to learn more about the tour. 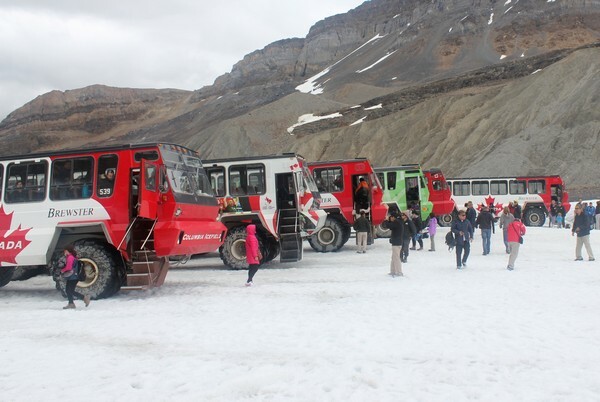 Many thanks to the fine people at Travel Alberta for providing us complimentary tickets for the Columbia Icefield Glacier Adventure. As always, expressed opinions are entirely our own. We had a great experience and would recommend this tour to friends and family.